GingerMay Marketing is a specialist PR and strategic communications agency based in London & Tunbridge Wells. They have a reputation for building strong, targeted campaigns and needed a website to match. 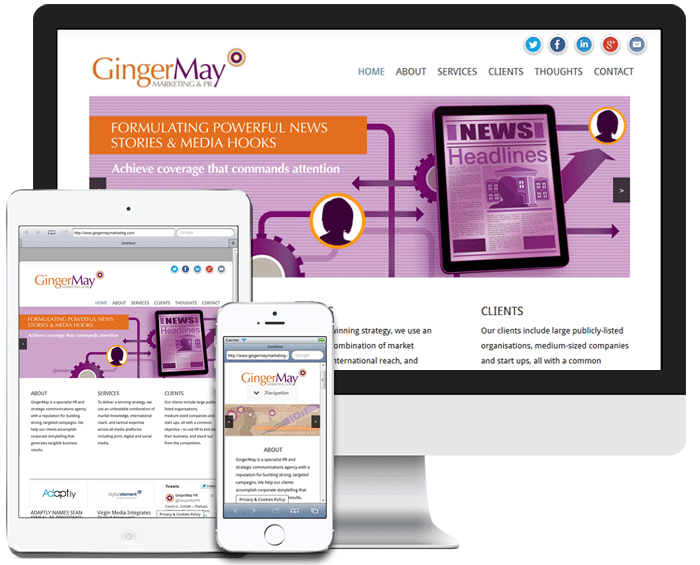 The site is built using WordPress with content, graphics and photos supplied by GingerMay. Thanks to the WordPress Content Management System, the GingerMay team can add their own blog entries and keep the site up to date without the expense of having us do it for them. When we looked to redesign the GingerMay website we spoke to a number of different companies, but Oakes Media really stood out as having the creative knowledge and expertise we were looking for. Ian was really interested in our ideas and made some excellent suggestions that we just wouldn’t have considered. He was also very responsive and changes were made quickly to a very high standard. The whole process was really simple and given we are a really busy company, he made it completely painless. We are absolutely delighted with the results, so if you’re looking for a new website I can’t recommend Oakes Media highly enough.